Less than 20 years after discovering the first world beyond our solar system, astronomers have bagged alien planet number 700. As of today (Nov. 18), the tally stands at 702 exoplanets, according to the Extrasolar Planets Encyclopedia, a database compiled by astrobiologist Jean Schneider of the Paris-Meudon Observatory. Schneider's list is one of two main alien-world trackers out there. The other is called "PlanetQuest: New Worlds Atlas," run by NASA's Jet Propulsion Laboratory. PlanetQuest's current count stands at 687; the difference between the two databases highlights the uncertainties involved in exoplanet detection and confirmation. Regardless, both tallies have been growing quickly lately. And both will add hundreds, or perhaps thousands, of new alien planets in the near future. But the finds have been piling up recently. The count topped 500 in November 2010, and it passed 600 just two months ago when scientists with the European Southern Observatory announced 50 newfound planets, including one "super-Earth" that might be a good candidate for hosting life. And the pace of discovery is only going to keep accelerating, as scientists continue to hone their planet-hunting techniques and the data continue to pour in. The finds of one instrument in particular could more than double the number of known exoplanets. Since its launch in 2009, NASA's Kepler space telescope has identified 1,235 planet candidates. To date, just 25 of them have been confirmed, but Kepler scientists have estimated that around 80 percent will end up being the real deal. The numbers by themselves are exciting, but the search for alien planets isn't just about increasing the tally. Rather, it's a quest to better understand the nature and diversity of alien worlds in our galaxy and beyond, researchers say. And that diversity appears to be huge. Astronomers have found one planet as light and airy as styrofoam, for example, and another as dense as iron. 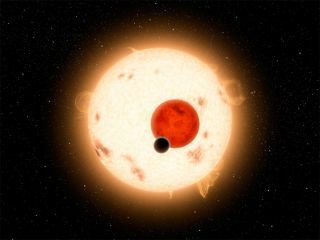 They've discovered an alien world that orbits two suns, like Luke Skywalker's home planet of Tatooine in the "Star Wars" films. And, perhaps most intriguingly, they've confirmed a number of planets that appear to orbit in their stars' habitable zone, that just-right range of distances where liquid water — and maybe life as we know it — could exist. "There's zero indication that the surprises are petering out," astronomer Greg Laughlin, of the University of California, Santa Cruz, told SPACE.com recently. "Just looking at all the new discoveries on the preprint server [where many studies are posted before being published] is close to a full-time job."